A Limited Number Of Reprint Rights Are Now Available For "Blog Link Generator"! 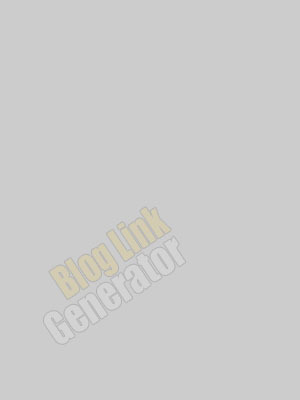 For a Limited time you can get Resale Rights to "Blog Link Generator", and keep 100% of the profits from all your sales ! Most of my friends think I am crazy for selling Blog Link Generator, they all agree I should have kept it top secret and only shared it with them! Well I know that you can't say that about Blog Link Generator because it is brand new! If you' have ever planned to make boat loads of money selling something through Internet Marketing, Then Blog Link Generator is exactly what you have been looking for. 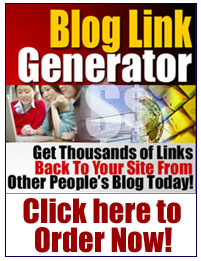 Here's how it works, you will be able to sell Blog Link Generator to as many people as you want for any price above $ 97. We recommend you sell it for between $ 147 and $ 197 dollars. But you may under no circumstances ever sell it below $ 97 this will keep the market at a good level for the other resellers. Our Blog Link Generator resale rights package would be insanely under priced if I charged $697 for it. Free updates to Blog Link Generator software forever, and resale rights to the updates as well. A copy of Blog Link Generator web site's proven sales letter, all the graphics, and thank you pages so you can upload them to your web space and be reselling the software in minutes after your purchase. Act Fast! I am selling a very limited number of resale rights licenses for Blog Link Generator. Order reprint rights to "Blog Link Generator" right now and not only will you get the rights to sell this software keeping all of the profits for yourself - I'll also toss in "PRIVATE LABEL RIGHTS"
Call it BlogPoster, Blog Linker, you name it its up to you, or you may just resell it under it's current name "Blog Link Generator "
We’re so sure that you will love “Blog Link Generator” that we’re offering an Unconditional 100% Money-Back Guarantee. 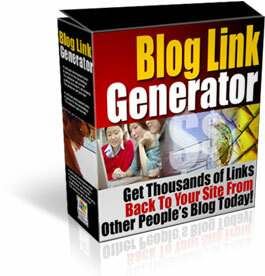 Order “Blog Link Generator ” Now!